"To Lie Down with the Wolf and the Lamb, Such is the Will of Gaia" The most empathic of all the werewolves, the Children of Gaia believe that the Wyrm cannot be defeated with its own tactics of violence and destruction. Only by returning hate with understanding, by ever-forgiving one's enemy, will the Apocalypse be diverted. The third Tribebook looks at the Children of Gaia: their enduring history, legends and behavior, as told by a Child of Gaia sage. This heavily illustrated book reveals the hidden triumph of good over evil throughout history. 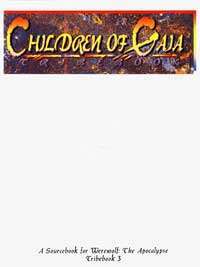 Includes: The history and culture of the Children of Gaia, a Legends of the Garou comic book, five ready-to-play character templates.